Do you want your candlestick to look like this? 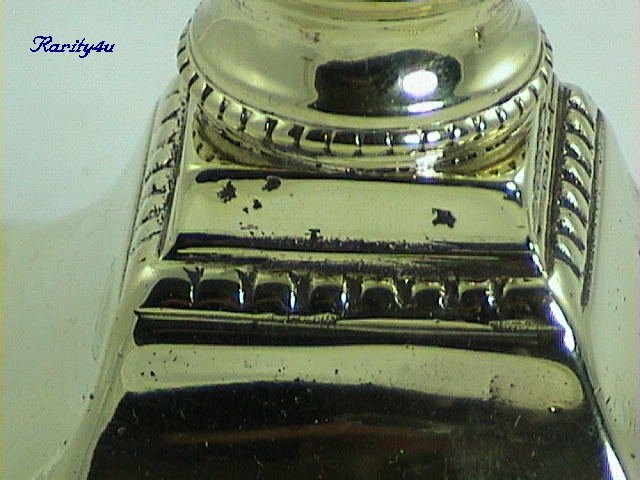 By using old technology, eco unfriendly metal polish and equally old fashioned cleaning methods your candlestick may end up looking like this. Why, because the metal polish you use probably contains acid or ammonia as the liquid component and this will be the result. Too many antique metal items are being defaced and destroyed by ignorance and down right cussedness. pH Neutral eco friendly metal polishes are available but people are reluctant to change from their good old traditional methods and metal polish that are both time consuming and expensive. Not convinced, then read further. Do you regularly wash in horse urine? Do you regularly splash acid all over your skin? If the answer to these questions is no, then why subject your brass candlestick to this treatment? During the 1700´s, metal polish was not available so the butlers and servants made their own polish. The horse was the major means of transport, so large houses had a stable full of horses and hence a regular supply of straw bedding and urine. The straw was ground into a coarse powder and then mixed with the urine to make a paste. This paste mixture was found to be a good cleaner for brass and copper items. Similarly the cooks would make pickles, jams and marmalade in the kitchen with the produce from the fields and garden. Copper and brass were used extensively as cooking implements during the 1700´s and 1800´s, and during the cooking process it was found that the acid from the fruits and the vinegar used for preserving made the copper and brass items clean. Thus the metal polish industry was founded. Acid or ammonia was used as the liquid component and coarse ground straw as the abrasive component and the technology has changed very little during the past 300 years. 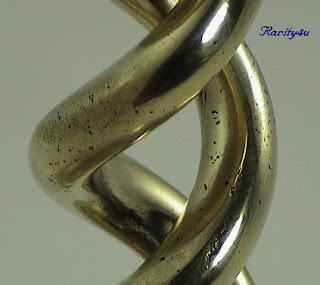 What the metal polish industry does not tell you is the more you use their product, the more you have to use it – good for profits but not so good for your wallet. Also the polish you use systematically destroys the item you are trying to preserve. The acid etches the surface of the metal and can cause the conditions for pitting and crevice corrosion to begin. The acid also speeds up the oxidation process, so you have to polish more often. Ammonia is an extremely bad liquid to use on brass because brass is an alloy of copper and zinc and the ammonia dissolves the zinc creating the holes known as pitting. If that was not bad enough, the abrasives used are usually too coarse causing surface scratches but worse still wears away the metal item. At first glance pH Neutral metal polishes maybe slightly more expensive when compared with the cheaper alternatives, but on closer examination this may not prove to be the case. So what are the advantages and disadvantages of these polishes. From the above you can calculate the true cost of the eco unfriendly polish and then compare it with the cost of the eco friendly polish. If you calculate the time spent polishing and then add in the cost to repair or replace the damaged item you then get the true cost of using the eco unfriendly polish. Perhaps you want to spend your free time polishing antique metal items over and over again, but it is not my idea of fun. Easy Shine is a pH Neutral metal polish that does not harm the environment nor the item you are trying to conserve.